A prerequisite to loving old books is, of course, an enjoyment for reading. One can appreciate old books, collect old books, and admire the architecture of their spines and ornate cover designs without reading. But this is to love the value of the books or their aesthetic appeal. This is not the same as loving old books. It is not to get caught in the life of the old book itself, to look upon this simple object with words and covers and feel something more than an object of value. I have discovered that I am book addict. I like books. I buy them. But there is something about an old text, an antique text, that has a whole other appeal to me than the latest modern novel or the latest academic musings. As I hold an old book I realize a few things. First, the life of the author rushes through my mind. I imagine a person that prior to modern distractions poured their shade and energy into this text. Someone who by a dimly lit light, or perhaps even a candle, pen in hand, quarreling with their imaginations how to speak what cannot be spoken. How this pre-post-modern person toiled with their ultimate concern and endowed their characters or their topic with the same passion that occasioned this act of creation at the beginning. Books are pieces of people with dreams, hopes and aspirations. The text is the collision of the author and their context…the latter of which is usually lost on us and the former of which we think to be mechanical. An example is a recent antique book I bought by Mary Johnston. Her two volume civil war historical fiction, “The Long Roll,” & “Ceasing Fire,” (ca. 1911 & 1912) are fictional attempts to honor and boldly imagine the Confederate struggle from within a Confederate sympathy a generation after the conflict. Long before the genre of war fiction took hold, Mary Johnston was trailblazing a new way of writing fiction inside history, a bold attempt to give historical figures an additional life. But what makes Mary so alluring to me as I hold her books is that she was the daughter of Confederate General Joseph Johnston, the last General to make a stand against Sherman in Resaca, Ga, May 1864. Here is the child of a man that made history and was part of the deepest and darkest conflict in our nation. Here is a woman born in the South during Reconstruction, her life animated by the stories her father told her, feelings that have not yet healed from the conflict. Here is a woman that probably still shared the lost dreams, lost hopes, and lost loves of a lost cause. When I hold her book I wonder what was she thinking, why choose this scene, what she felt as she recounted these memories and stories and did she cry as she began to blend history with fiction. Was her book the process of writing her dream and justifying her affections? Were these books exploding inside her or were the words like removing the sword from Kings Arthurs stone? Second, I like old books because I don’t imagine we know more than their authors. One of the most efficient lies of the Enlightenment is that of progress. The general public thinking they have progressed past the opinions and ideas contained in these old dusty pages. Whole worldviews and animations have been lost because we are so confident that our perspective on history is the correct one. We rarely consult antique books for anything more than mantle decorations when within them one might find that our ideas are not nearly so novel. We think their opinions or stories to be irrelevant on history and we formulate our historical, fictional, scientific, or whatever opinion, absent the people who actually lived and wrote about it as it was happening. And this generality extends to fiction as well. As any great author will tell you, fiction is always contextual, erected from a world of events that make the fiction pertinent. To read fiction as if it is created in a vacuum is to misread it and to think we generate thoughts blindly. The context of this passage is the influence of Wells’ Englishness on his work and its interaction with the world. But his point is noted: our writing is always a writing of civilization and generally the really well written fiction is always about imaginatively encountering a non-fictive problem with characters and words that are able to take the heat of criticism and enter places the author would never be able to venture. Thus, time would fail us to imagine all the idiots that have commented on Evolution and never actually read Darwin or considered his context! Time would fail to note how much anti-southern sentiment has been forged apart from reading any Southern literature from the 1840s-1880’s! Time would fail to recount all the people that love to invoke Shakespeare because it makes them sound smart yet they have never thought deeply about any play he wrote! And herein lays the problem: our opinions are often baseless because they are without history, fictive, non-fictive or otherwise. We have our opinions and they are informed by nothing but ourselves…as if our ideas born when they are necessarily implies they are forward progress. But we should not be relegated to ahistorical opinions because we have old books that allow us to position ourselves historically. Old books contain sentiments against, and within which, we are able to position ourselves and participate with those that have lived and died. We are able to partake of their wisdom, read the words of lives less busy but far more passionate, and imagine a world in which entertainment, education and imagination blend together in indistinguishable ways. Thirdly, I imagine all the people that have held the book I now I hold. As I sit among dusty books, many of which as old as my great grandparents x5, I imagine all the hands that have sat on porches or in libraries and held this very book. I imagine why they would bother. What had the hands experienced before or after reading this that would make this book worth their time? On a daily basis many of us are removed from the dead, they are still and alone in their graves on the outcroppings of hills we have long forgotten. Yet when I hold a book published in 1870 I am instantly in connection with someone that is no longer with us. My hands are turning the same pages. I am holding the same covers…I am perhaps even placing my fingers in the same places on the same pages as someone who is now deceased but has come to this book for a reason, a reason that might not be dissimilar to mine. I read this old text, write and talk about it with my friends. Perhaps those who owned this book long before me did the same. Old books are symbols of dead people, writers from which they originated and owners who can no longer hold them because they are no longer physically present. It is this piece of people and the invisible mark they leave behind that enthralls me, captures me and churns my mind. In an eerie way I feel as if the people I will never know I now instantly know because I have shared history with them…we have shared this book. And long after I am dead someone will share this book with me even if they do not realize it. 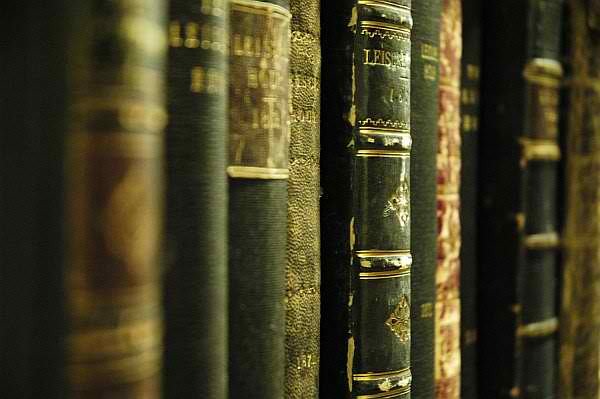 Fourth, the smell of old books is the smell of paper that has lived. There is nothing like walking into a room filled with books, the smell of time bursting through your senses. To stare up at the stacks of time that are lost, yet found, preserved yet forgotten, is as close as we get to an incarnate representation of human creativity. Ancient civilizations have built monuments and stones that are still reminders of their creativity, but these are now giving way to weather and time. But words…words cannot be destroyed. They can be torn from their sentences but they cannot be lost. They will always find their way back home no matter how much fire is heaped on the pages that contain them. Roman arches may have fallen and Greek Temples may be decimated, but the words of Parmenides, Anaxagoras, Plato and Marcus Aurelius still live. Taking an old book into your hands, opening it up and shuffling its pages produces that distinctly old book smell…the smell of time, of aged paper, of ideas inviting you to pause and consider that the smell can take you somewhere. They have been carried through heartbreak. They have been secured in backpacks during wartime. They have been the relief of troubled souls wandering the four corners of the earth. They have been expressions of joy and inspiration for their readers. They have slid around on the floor board of old carriages or sat in the window sills of widows who have lost their loves. They have been hid under old saloon counters waiting to be read by bartenders at the end of the night. They have even been carried by prostitutes and read after a long nights work, feeding the imaginative and intellectual need of a woman or man that had been trapped in this dark industry, the participants of which are now all dead. They have been carried by people into countless places, read for a plethora of reasons and now they are still here, speaking to us, as we hold them in the same way as history has always held them since their inception from the press. So, I confess again, I love old books. As I hold an old book, I hold poetry that can never be held. I hear dreams that were once only seen. I sympathize with the author and envision them standing beside me. I weep for their loss, share in their joys and continue to toil over the problems their book addresses…and I wonder how many eyes have seen these words in these very pages…stared at them like me…and wonder how much of their soul soaked up these words. The warmth of hands that held these books long before I was here is still present…and I wonder if hands in the future will feel the warmth of my own imprint on these very books.